Meritor WABCO has announced that the OnGuard Collision Mitigation System is now available for use in medium-duty trucks for the first time. OnGuard is a radar-based active safety system for commercial vehicles that offers collision warnings and collision mitigation with active braking, as well as adaptive cruise control. The OnGuard collision mitigation system detects objects ahead and measures the vehicle’s position in relation to others on the road to warn the driver of possible a rear-end collision by providing audible, visual and haptic warnings. It has been available for heavy-duty trucks for several years, but this is the first time the system has been offered in the medium-duty segment. The OnGuard system is “always on,” monitoring the road and providing warnings and active braking, even when the cruise control is not set. When a potentially dangerous driving scenario is detected, the collision mitigation system responds by sending warnings, automatically reducing engine torque and applying the foundation brakes. A distinguishing feature of OnGuard is the ability to “see” in limited-visibility conditions, thanks to its superior high-resolution, long-range radar. According to the Federal Motor Carrier Safety Administration, nearly 12 percent of heavy-truck accidents occur in limited visibility and represent 20% of heavy-truck crash fatalities, according to FMCSA Large Truck and Bus Crash Facts, 2013-2015. A new member of the OnGuard family to be made available to medium- and heavy-duty trucks in 2016 is OnGuardACTIVE, which warns and brakes when detecting stationary objects, to mitigate or possibly avoid a potential accident. “Meritor WABCO is very pleased that medium-duty trucks will now be able to realize the same benefit that fleets with heavy-duty trucks have gained by using OnGuard to reduce frequency of rear-end truck collisions, damage and costs as well as reduce injuries and save lives,” said Stephen Hampson, the president and general manager of Meritor WABCO. 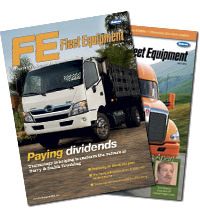 Hampson added that heavy-duty truck fleets have reported a 65-87 percent reduction in accidents and up to an 89% reduction in accident costs since employing the OnGuard system.